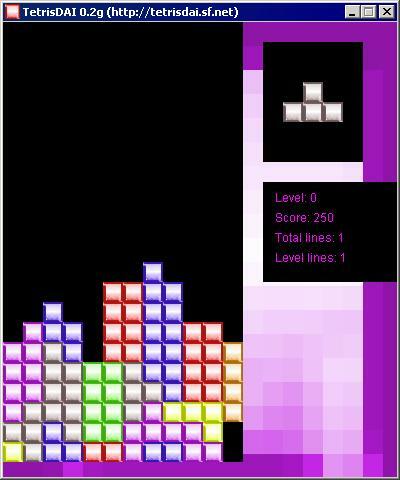 “TetrisDAI” is an open source Tetris clone (highly modular) written in Java 1.6 (aka Java SE 6) with NetBeans. Official web site: http://tetrisdai.tuxfamily.org/ (mirror at http://www.dhtmlgames.com/tetrisdai/). Here are some games in C language I made during the time I was studying the “Programació estructurada i modular / Programación estructurada y modular” (Structured and modular programming) subject that belonged to “CFGS DAI (Ciclo Formativo de Grado Superior en Desarrollo de Aplicaciones Informáticas)” which is a Software development associate degree equivalent (similar to Foundation degree in the UK, Diploma of Higher Education in Scotland or Higher Certificate in the Republic of Ireland) at IES Baix Camp school in Reus city (Spain). All are text-based games. It includes a Blackjack (aka Twenty-one) card game, a roulette game (with four different ways to play), a John Conway’s Game of Life (cells can be inserted either manually or randomly), a Mastermind game, Buscacaminas (pathfinding program with some Minesweeper characteristics), Pongetet (a pong game) and Pilotes (just a bouncing text generator). The IDE used was Bloodshed Dev-C++. In fact, this game is not only a game but many since the player can configure it to play Tic-tac-toe, Connect-4 and other similar games. You can configure the number of human players (1 or 2 players), who will start playing first (first player or second player which can be either the computer or a human), board size, the necessary pieces in a line to win, the colour of the pieces and choose whether to use gravity or not (with gravity the pieces will fall down as in Connect-four). Official web site: http://conectayas.tuxfamily.org/ (mirror at http://www.dhtmlgames.com/conectayas/). Official web site: http://buscayasminas.tuxfamily.org/ (mirror at http://www.dhtmlgames.com/buscayasminas/). Official web site: http://yasminuroban.tuxfamily.org/ (mirror at http://www.dhtmlgames.com/yasminuroban/). Official web site: http://tetrissimus.tuxfamily.org/ (mirror at http://www.dhtmlgames.com/tetrissimus/). This game doesn’t use any image at all, just pure HTML and CSS. Official web site: http://punkpong.tuxfamily.org/ (mirror at http://www.dhtmlgames.com/punkpong/). Official web site: http://ranisima.tuxfamily.org/ (mirror at http://www.dhtmlgames.com/ranisima/).